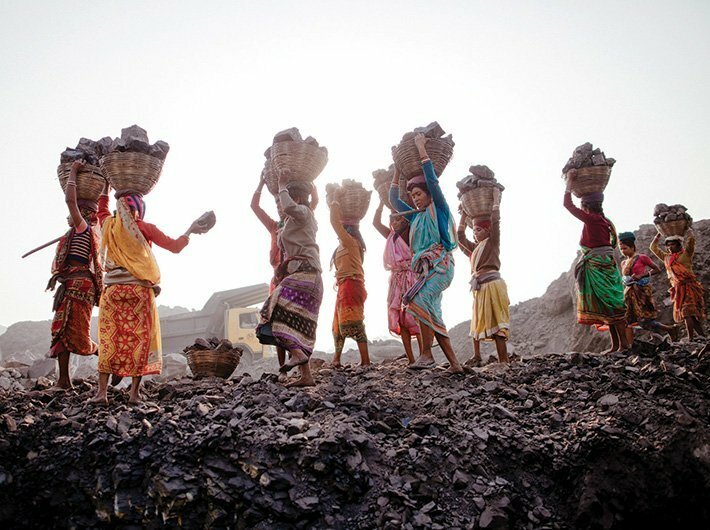 India has slipped in the Global Gender Gap Index ranking of the World Economic Forum, just days after it did so well in World Bank’s ease of doing business. It now stands at 108th position. The Global Gender Gap Report 2017 said that India experienced a decline in its overall Global Gender Gap Index ranking, largely attributable to a widening of its gender gaps in political empowerment as well as in healthy life expectancy and basic literacy. 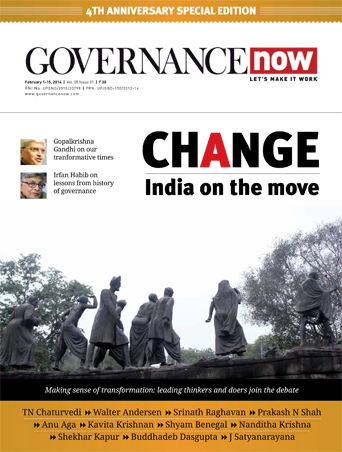 “In addition, newly available data reveals the scale of India’s gender gap in women’s share among legislators, senior officials and managers, as well as professional and technical workers for the first time in recent years, highlighting that continued efforts will be needed to achieve parity in economic opportunity and participation. “More positively, India succeeds in fully closing its primary and secondary education enrolment gender gaps for the second year running, and, for the first time has nearly closed its tertiary education gender gap,” it said. The WEF said that the country continues to rank fourth-lowest in the world on health and survival, remaining the world’s least-improved country on this subindex over the past decade. It said that this year, the economic gender gap has reverted back to where it stood in 2008, after a peak in 2013. On current trends, the education–specific gender gap could be reduced to parity within the next 13 years. 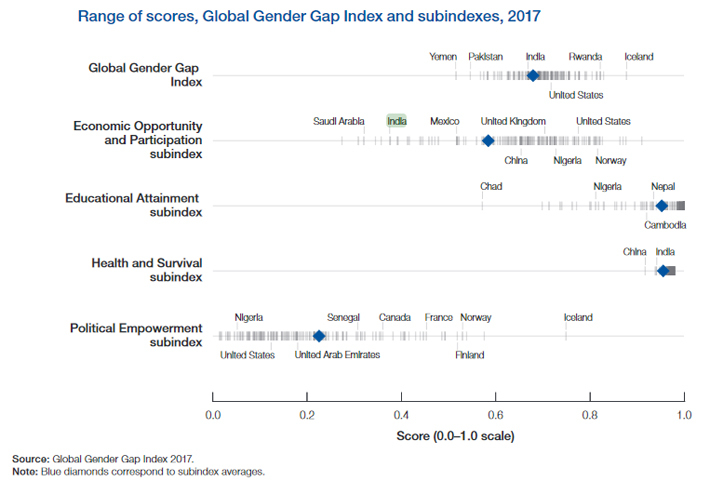 The widest gender gap, in the political dimension, is also the one exhibiting the most progress, narrowing by 9% since 2006, despite a slowdown in progress this year. On current trends, it could be closed within 99 years. The time to close the health gender gap remains undefined. Formally the smallest gap, it has oscillated in size with a general downward trend. Today, the gap is larger than it stood in 2006, in part due to specific issues in selected large countries, in particular China and India. The report also noted that on average, low-income countries have closed 92% of their labour market participation gender gaps. By contrast, lower-middle income countries such as Egypt, India, Sri Lanka, Bangladesh, Guatemala and Indonesia have, on average, closed only 67% of their labour market participation gender gaps. That figure rises to 75% for upper-middle income countries and onto 78% for high-income countries. Klaus Schwab, founder and executive chairman, World Economic Forum, said that talent is one of the most essential factors for growth and competitiveness. To build future economies that are both dynamic and inclusive, we must ensure that everyone has equal opportunity. When women and girls are not integrated—as both beneficiary and shaper—the global community loses out on skills, ideas and perspectives that are critical for addressing global challenges and harnessing new opportunities. “This report finds that, globally, gender parity is shifting into reverse this year for the first time since the World Economic Forum started measuring it. Yet there are also many countries that have made considerable progress, understanding that talent is a critical factor for growth. These countries are poised for further success. “This year’s analysis also reveals gender gaps at the industry level and, in particular, highlights that even though qualified women are coming out of the education system, many industries are failing to hire, retain and promote them, losing out on a wealth of capacity. As the world moves from capitalism into the era of talentism, competitiveness on a national and on a business level will be decided more than ever before by the innovative capacity of a country or a company. In this new context, the integration of women into the talent pool becomes a must,” said Schwab.